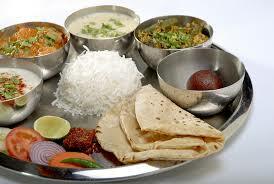 Gujarat is primarily a vegetarian state due to influence of traditional Hindus and Jains living here. However, some people relish non-veg dishes too as the extensive coastline serves wholesome sea food! The Kharwa community does enjoy fresh fish as well as dried fish preparations along with prawns, gedadas, pomfrets, surmai, crabs, lobster, khandwas and narsinga (calamari). The staple diet of people living in Nadiad in Gujarat state comprises of rotli, dal or kadhi, shaak or sabzi - a combination of vegetables prepared either spicy or sweet in taste. They also eat khichri (mixture of lentils and rice), chaas or butter milk and pickle. They commonly add jaggery or sugar in dal and sabzi. Bajra roti, Bhakri (thick roti prepared during winters), garlic chutney etc. are also common food here. Gujaratis will often refer to Dal-Bhat-Rotli-Saak as their daily meal. Some families eat moong dal on Wednesdays for sure! Have you ever tasted Keri no ras (fresh ripe mango pulp) during the mango season? Hmmm... remember the lovely taste! However, if it is a fast for someone, the diet will include only milk, dried fruits and nuts. Well, sweets include Magas, wheat-based sweet dish like lapsi or ladoo and Ghooghra prepared during festivals. And farsan? Yes, you guessed right! Side dishes or farsan make for light meals. This dish is a part of everyday meal for Gujaratis. People in Nadiad love to prepare thepla at home and eat it with meals or even carry some during picnics! Eat hot or cold, with curd and chunda or add jeera, methi, doodhi or til and make it tastier. Thepla is like spiced paratha (flat-bread in India) prepared from wheat flour, spices and fenugreek leaves. It involves kneading the perfect dough with the right amount of spices. Turmeric bestows colour to it while ginger-garlic paste gives it a delectable aroma. 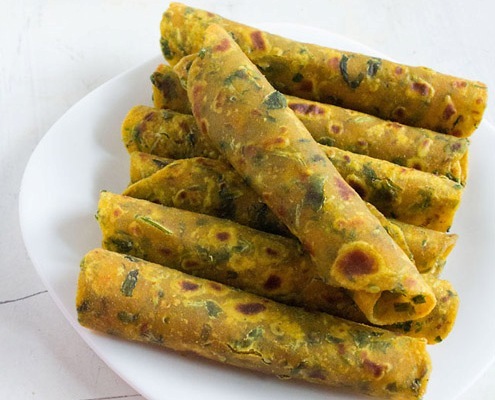 Ingredients: 2 cups whole wheat flour, 1 tbsp oil, 2 tbsp curds (dahi), 1/4 tsp turmeric powder (haldi), 1 tsp chilli powder, salt to taste, whole wheat flour (gehun ka atta) for rolling, oil for kneading and cooking. Mix all the above ingredients in a bowl and knead into a thick dough by putting little water and oil in it. Keep aside for about 10 minutes. Now make small portions out of the dough and roll each portion into a ball. Flatten it like a chappati and using little oil, cook it on a griddle (tava) till it turns golden brown on both sides. Serve hot with chunda or sweet mango pickle. Well, now when you have surprise guests in your house, you know what to serve them! Thepla of course! Not only the Gujaratis but everyone loves this dish. The sweet mango pickle adds to the taste. Thepla can be given to kids in tiffin too as it is very healthy and filling.